March 30th, 2015 was a red-letter day for us. 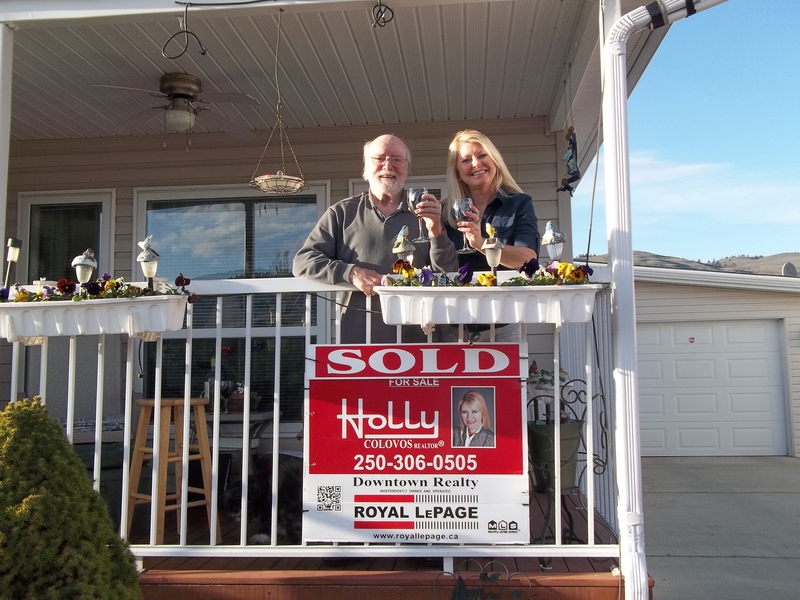 Above is a photo of Ian and our realtor celebrating our house sale with good British Columbia wine and some delicious hazelnut chocolates. Gayle had to take the photo so she is missing from the picture, but had her share of wine and chocolates. We have sold our house in British Columbia and will be moving back to Winnipeg, Manitoba starting in late May. The paperwork was signed March 29th by the buyers and us, with all conditions satisfied, downpayment was put into escrow and now arrangements will need to be made with lawyers, movers, lifelease managers, utility companies, etc., etc.. Besides making all the above arrangements, Gayle’s main task will be sorting and packing books. For her, going through her books is a joy, although time-consuming because she is continually tempted to start re-reading them. On the other hand, parting with books is a sorrow. As we age and prepare to down-size our household space, however, it becomes a necessary task. We will be selling a few pieces of furniture that will not fit into an apartment. Most of our furniture and belongings will be packed by a moving company on May 11th, but Gayle insists on packing the books in the order they will go onto our teak library shelves which at present take up an entire wall, floor to ceiling in our second bedroom and a tall bookshelf in the den, not to mention three shelves of cookbooks in the kitchen and two leather baskets of music books on either side of the piano. The initial task is to cull those books which she thinks she can probably live without–a huge problem for an admitted bibliophile and book collector. In 1996, after her late husband’s death, Gayle spent about a month going through Gus’s over-1000-book theological library in English, German and Latin and documenting it for an online theological bookseller who bought most of the collection. She also sorted through the other thousand-some volumes of books she and Gus had accumulated over 32 years of marriage, eventually selling to a local used bookstore Gus’s collection of poetry and some other books which did not interest her. That still left a pretty good-sized collection added to in 2003 by Ian’s smaller assortment of machining, how-to and Scottish-flavoured books and copies of the books we have published since 2010 kept in stock for sale locally. Interesting the items one encounters when sorting through books. Gayle was delighted to find the only copy of “The New Puppy,” the first book she ever wrote–a primitively hand-made white paper book with torn edges and taped seams, containing eight ca.-4-by-4 inch pages, one of which is illustrated with stick figures. She wanted to scan in that “book” before it got lost again, but that has proved too lengthy a task and has delayed this post being sent out. It will have to wait until after we get settled again. Finally the books that survived the cull are all packed into boxes piled into a corner of the den. A narrow, six-shelved bookcase (not for sale) awaits our moving sale this weekend, laden with the books Gayle decided she will probably never have time to re-read and, should she want to, she’ll have to borrow them from a library. For sale now are a complete collection of C. P. Snow’s “Strangers and Brothers” series that include 11 volumes on fictional British academia; nine volumes of Ian Flemings’ “007 James Bond” original works in paperback dating from the late ’50s and early 60’s; 14 of Elizabeth Peters’ paperback books about Victorians Amelia Peabody and her husband, Radcliffe Emerson, on their fictional archeological digs in Egypt; Margaret Truman’s 16 mysteries set in Washington, D.C., such as Murder in the White House, Murder in the Supreme Court, etc. – and then assortments of other books of a great variety. Gayle hopes others will want to buy them at low cost and get as much enjoyment out of them as she has had. We are sure she is going to have some separation anxiety as the books go out our garage door on Saturday. Such is the life of a bibliophile. This entry was posted in collecting books, moving, selling a house and tagged arts, bibliophile, hobbies, how a book can add value to a reader's life, reading. Bookmark the permalink.